Are Charles and Camilla about to become the latest new GTC members? 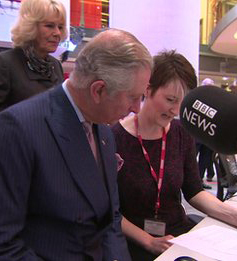 When Prince Charles and the Duchess of Cornwall dropped into BBC Radio 1's Live Lounge yesterday as part of a tour of New Broadcasting House in a celebration of British radio both seemed eager to get behind the camera. First of all Prince Charles jumped on camera during the live session with singer / pianist Tom Odell, before handing over the controls to his wife Camilla, who stayed on camera for some time until relieved of her duties by presenter Fearne Cotton. Should we now be sending a couple of GTC application forms to Clarence House?